A submarine trip to an island of ghosts. A band of fugitive actors. A deadly draconian who has had too much holiday punch. And veritable onslaught of dryads, shadow wights, and that rarest of all monsters, the dread forest boojum. Also, from the team of Margaret Weis and Don Perrin, the latest adventure of Kang and his wayward troop of draconians. 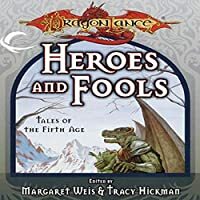 In the proud tradition of the best-selling Dragonlance anthologies, Heroes and Fools promises a sometimes heroic -- sometimes foolish -- visit to the world of Krynn.